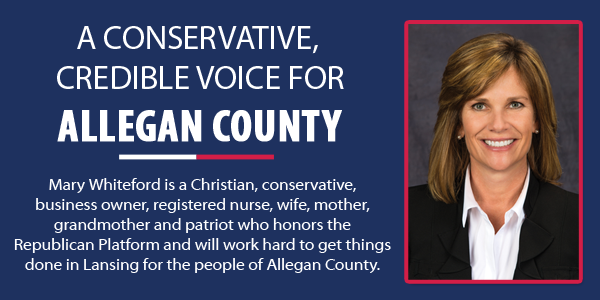 Mary Whiteford for State Representative | A Credible, Conservative Voice for Allegan County. Mary Whiteford believes in common sense, conservative leadership. Lower taxes, less government and more freedom. Click below to learn more about Mary. Click below to find out more about Mary's extensive community involvement, leadership positions, education and political involvement. Our next representative needs to be a credible, conservative, hard-working employee of the people of the 80th District. Join Mary's team today.